The talented Ian Barnard of Vintage Design Co is back with more donations of awesome resources for Access All Areas members. 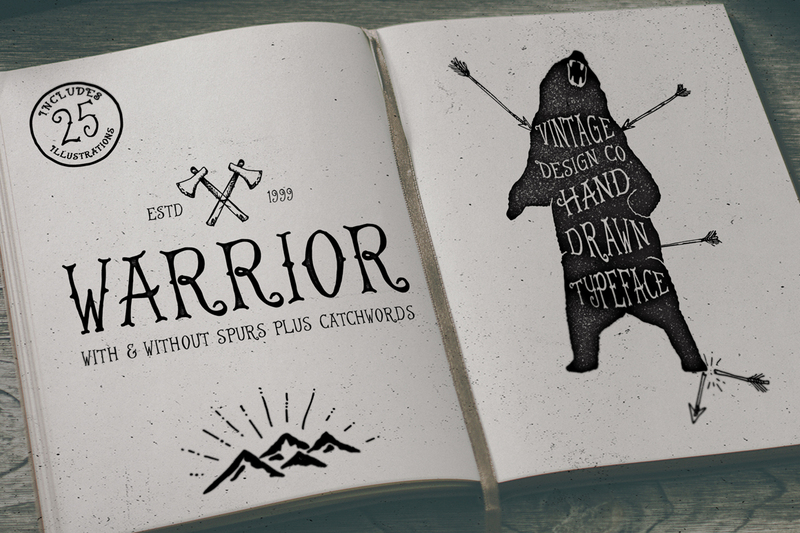 His Warrior font is a hand drawn typeface inspired by the love of vintage, the outdoors and a time when everything was made by hand. Alongside its Regular format, it comes with an alternative version without spurs, a special catchwords font file, and a collection of 25 vector graphics to give you a head start when creating your own hand lettered illustrations. The popular Warrior typeface from Vintage Design Co has been generously donated for Access All Areas members to download and enjoy. Its hand drawn style and the bonus pack of vector graphics are the perfect combination for creating vintage outdoors themed designs. Chris, you are a very generous chap, with exceptional taste – thank you for your excellent freebies! Thanks Chris, but the real credit has to go to the generous designers who share these awesome goodies, which in this case is the talented Ian Barnard from Vintage Design Co. I have followed Ian on the Creative Market for about a year now and I have purchased several products of his from the Creative Market and I have yet to be disappointed. Ian is amazing! I have been following Chris on here for a few years and he is super awesome for helping all of us become better designers through his website. Huffo is 1000% right! Being a premium member does rock! Thanks again guys! Beautiful work! Thank you so much! I love Vintage Design Co. and think Ian is a very gifted artist and this is a very generous of you both. Thank you so much Chris and Ian!! Thank you Ian Barnard from Vintage Design Co. Excellent work!! You are very talented. Nice pick Chris! Being a premium member rocks. This is a gorgeous font- thank you SO MUCH for sharing!!! Love the vintage style of this typeface, great work!